To move a shape up, down, left, and right (except not backwards! 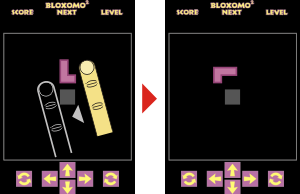 ), tap the directional pad at the bottom of the screen or tap next to the shape. 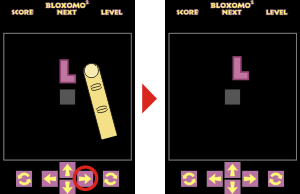 To rotate a shape, tap one of the buttons at the bottom of the screen. 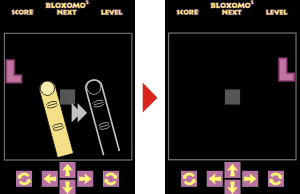 You may also tap the shape with two fingers to rotate it clockwise, or (when enabled in the settings menu) swipe diagonally down and to the left for clockwise or down and to the right for counterclockwise. To drop a shape quickly in the direction it is falling, swipe quickly in that direction. 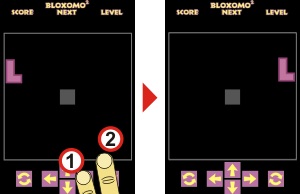 You may also tap the corresponding button on the directional pad and then (while still touching the direction button) tapping anywhere else on the screen. 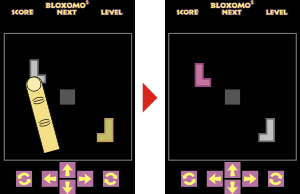 In levels with more than one shape, the one you are currently controlling will be in color and the others will be gray. 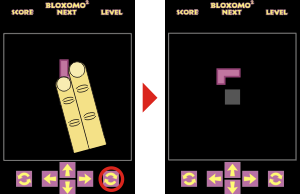 Tap a shape to select it for control.